It’s been a while since I posted something in here, but it’s not because there hasn’t been anything going on. On the contrary. 2018 was probably the busiest year for me to date, and it doesn’t seem to be letting up in 2019. But that’s how I want it. I’m releasing a brand new book (WIDOW TOWN) in Norway on the 28th of January. It’s a first novel in a brand new series which I’m super excited about. I can’t wait for you all to read it. Hopefully it will get a wide translation. Then later on in the year I’m releasing another book that I’ve written with Jorn Lier Horst, another Norwegian crime writer. We did our first book together last year, Death Deserved, which currently is in translation. In between all the writing I will be travelling quite extensively. So far I have at least a dozen stops, and I know there will be more later on in the year. So stay tuned. You can follow me on Twitter, Facebook and Instagram, as I probably will be sharing more frequently there. Thanks for reading and caring! On the weekend between Friday the 16th and Sunday the 18th of March I'll be present at this year's Krimimesse in Horsens. It's one of my absolute favourite festivals, not only because it's hosted in one of my favourite countries in the world - Denmark - but also because the festival itself is such a great one. It's held in an old prison, so the setting couldn't be more perfect. It's my third time at the festival, and I can't wait to meet old friends and make some new ones. On the Saturday I will be talking about main characters and whether having one is a freedom or a stray jacket. On the panel with me is the lovely Elsebeth Egholm and the wonderfully talented Morten Hesseldahl. The next day the audience is in for an all Norwegian treat, as I'll discuss how we use our former professional lives in our writing, together with Torkil Damhaug and Jørn Lier Horst. Should be an interesting panel. Here's the rest of the program. Directly after Granite Noir Thomas and the rest of the Orenda Team go on a mini tour in England. We hit three cities in three days, and it was so much fun last year. This time around will be no different. 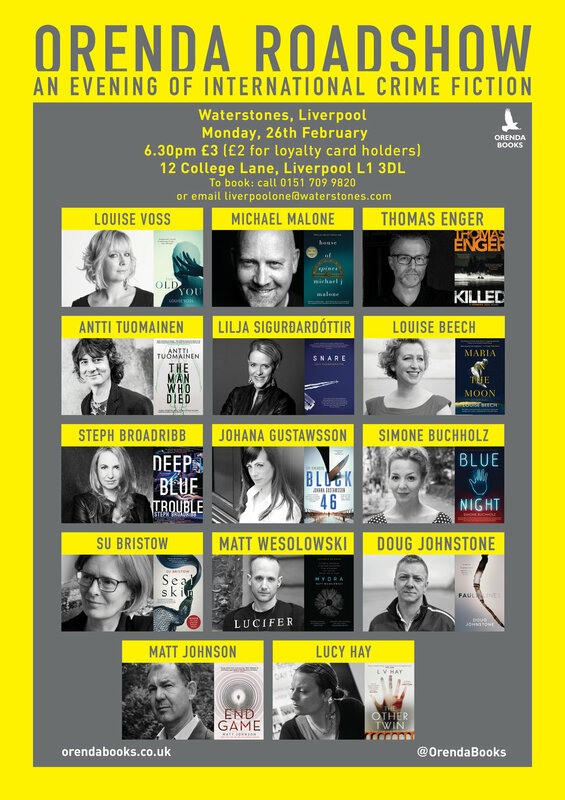 On Monday 26th of February we will be at Waterstones, Liverpool. The event starts at 6.30 p.m.
On Tuesday 27th of February we will be at Waterstones, Nottingham. The event starts at 6.30 p.m.
And on Wednesday 28th of February the crazy gang of amazing authors will be seen at Northgate Methodist Church in Warwick. Doors open at 6.30, but the event itself starts at 7 p.m.
During the roadshow the audience will get the chance to meet Louise Voss, Michael J. Malone, Lilja Sigurdadottir, Lucy Hay, Antti Tuomainen, Doug Johnstone, Steph Broadribb, Su Bristow, Matt Wesolowski, Louise Beech, Simone Buchholz, Sarah Stovell, Matt Johnson and the lovely Johana Gustawsson. Friday 23rd to Sunday 25th is this year's Granite Noir, taking place in the wonderful granite city - Aberdeen. I participated in last year's inaugural event, and I'm so happy they wanted me back. I'm doing a Words and Music Scandi Style event - alone - as it also will be the official launch of my next book in the UK/US - Killed. Here you can find some more details about the event. It's FREE. And here are the details for the rest of the festival. Some TOP names are going to be there. Thomas Enger's next book will be a collaboration with the award-winning author Jorn Lier Horst. It's a first time collaboration for the both of them, and the novel called NULLPUNKT (Norwegian) will have its release in Norway in late May, 2018. The book will be published by Jorn's new imprint, Capitana. KILLED, the fifth and final book in the Henning Juul series, is currently being launched in the UK. The book is part of a five week blog tour, where bloggers from all over the UK are reviewing and sharing their thoughts and views on the book. Here's also a very lovely review from the Lancashire Post.